Welcome back comic fans! I trust everyone has sent their Carnage Mind Bombs and Rune VS Venoms off to CGC! Everything Venom is hot so long as Donny Cates breathes on it. Oh please, oh please Mr Cates, just tweet about Strikeforce Morituri just once or maybe give Knights of Pendragon a little push! This week I have selected only the finest in spec you didn’t even know you wanted! Enjoy! I dig firsts, that is clear. So I got thinking, what is the first appearance of the first newsstand. Dell’s book appears to hold that honor. Got another? Feel free to comment! Are Godzilla books hot? There are a few I like for the PC but Godzilla books don’t exactly get buyers pumped. I do like first appearances though and apparently he debuted here?! As far I can tell the legends have their first sequential thrown down here! The new movies will eventually put the two in a title fight. Good luck finding high grade copies of this ghost. If Life with Archie 41 doesn’t do it for you then this is the behemoth’s US first. I cant confirm but it’s possible the two thrown down in a comic fight here as well. Many crazy books from Edge have shot into orbit, why not the first Anarchic Spider-Man? First appearance of Old Man Joker?! The Joker returns to Batman Beyond and it looks like it’s the real deal as teased all the way back in this issue. Old City Blues is getting adapted by Hulu. I have not read this but it sounds interesting. The book is an easy find. The leather bound edition is not. It looks like Mr Jip is going to be the primary antagonist for Cloak and Dagger season 2. Admittedly I have never been a Cloak and Dagger fan but Mr Jip is awesome! His conic firsts are a bit murky though. He first appeared in Marvel Age Annual 3. What I like here is that it doesn’t appear to be a preview of art from an upcoming comic, rather it’s a designed introduction to the character. If requiring a narrative is your thing to consider a first appearance, he makes his debut in Strange Tales 8 ( in shadow only ) and despite being in issues 9/10 he does not make his first full/first cover until Strange Tales 11. I like to try and pick some foreign stuff each week. Here is an early ALF appearance you are never going to find! And finally….Despite my jokes the Mind Bomb is real and the prices are insane. Looking for more rare stuff try these. I must warn you though, it won’t be easy! October 11, 2018 Venom, Narnia, Minecraft, God Country, The Secret Six and More! Cool list. Some really obscure stuff! Nice research Topher! 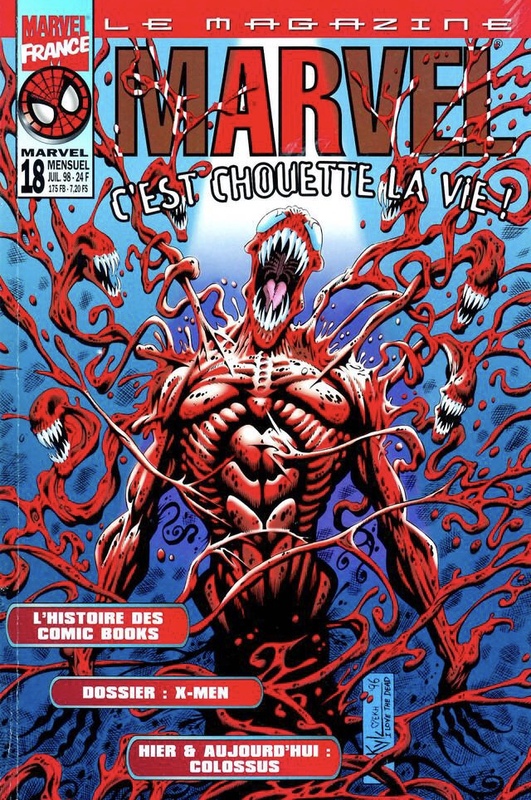 The last image comic you posted however is a French version of Carnage it’s a beautiful life. C’est chouette la vie is literal french translation of It’s a beautiful life. Don’t know if the Mindbomb story was part of that issue though so you could still be right. Yea I included Le Magazine 18 because the English version is heating up too! Great article now I need to find that archie book! Not a huge fan of Godzilla but a close friend is, so I picked up one of those Archies as a future gift. Should get a kick out of it. Still have no idea what is driving the sales of Mindbomb! I can’t find any first appearances or anything special about the book. Was the print run tiny? Did I miss something? Did someone buy all the copies remaining on the Milehigh web site where MileHigh in turn raise the price to insane levels making everyone think it is rare? That happened four or five years back when I ordered a bunch of Justice League Europe #33 with the sonic promo in it. They were about a dollar with the “secret” code word so I called and bought whatever amount they had listed which was I think 11 copies (maybe 12). A few days later I read online how Mile High had that issue for well over $100 and people were freaking out a bit. Could something similar have happened with Mindbomb, because not even two months ago it was as low as two dollars. I just can’t see that comic keeping its current value unless I am simply not seeing the big picture with it. Regardless, now is not the time to buy in my opinion…If you have extra, sell! SELL! Maybe you aren’t tracking this, maybe you are but just in case I’ll tell you. Donny Cates said this (mind bomb) is one of his favorites and it got him into comics. He went on to say that Web of Venom: Carnage Born is going to have direct ties to Mind Bomb. Take it for what it is worth. I agree with you, if you can’t find it in a dollar bin, pass this up. Unless you have one than sell it while the selling is good. The newsstands are the real score if you can find them! Mindbomb does have a relatively smaller print dun however I never saw this book at 2$ in the last 2 years at least! Thus was always a roughly 10 to 20$ book. If you did see it at 2$ I hope you bought regardless of Cates spec ot not. Oh no, I was just looking at closed sales to see where the book was at a month or so ago…Saw one sold for I think $1.70 before it got hot.